The great expansion of knowledge in recent years about the work of Rudyard Kipling (1865-1936) from new sources of information has made it possible, for the first time, to produce a genuinely complete edition of his poems. To the poems collected by Kipling himself this edition adds more than 550 uncollected poems, some of them unpublished. Every authorized text of the collected poems, from original periodical publication to the final edition in the author's lifetime, has been collated to produce a full record of the author's additions, deletions and alterations. A note to each poem provides a record of publication and, where possible, information about its occasion and context. 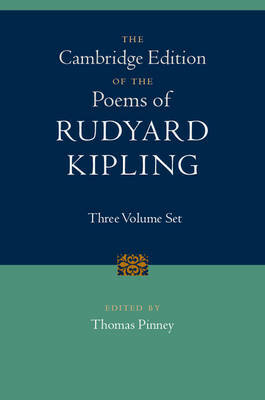 Through its completeness, its record of changes and its notes, the edition provides a new basis for the study and appreciation of Kipling's poetry.